Olivier Senat is thinking green. 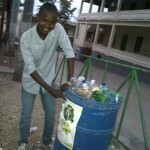 A 2013 SUSI alum, he created the program Jeunesse Verte Haitienne (JVH) to focus on educating youth about the environmental problems that Haiti, and the rest of the world, are facing. Due to its extreme poverty and debilitating natural disasters, Haiti is experiencing many problems with deforestation, lack of natural resources, and loss of functional soil for agriculture. Environmental conservation is an extremely timely and pertinent issue for the country, leading Olivier to decide to tackle the problem head-on. Focusing on youth, the JVH team decided to center their project on environmental awareness among middle- and high-school aged individuals. He’s structured JVH to have three main parts: conferences, recycling, and planting activities. 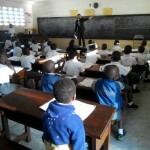 Conferences are held at schools in the Port-au-Prince area of Haiti and usually take place on Mondays, when all the students can be assembled. Olivier has structured his conferences to keep them at 15-20 minutes of information, discussions, and questions from the students. So far, he has had the chance to speak at Ecole Saint Joseph de Pétion-Ville (F.I.C. ), Institution Saint-Louis de Gonzague, Institution Sainte Rose de Lima, Institution du Sacré-Coeur de Turgeau, Ecole Jean Marie-Guilloux (F.I.C. ), and Collège La Providence Cambri-Loiseau. Olivier is also planning on implementing planting activities at schools in Croix-des-Bouquets. One of the most exciting developments with JVH occurred at Ecole Saint-Joseph de Pétion-Ville when the team was able to speak in front over 400 students, teachers, and faculty members on the importance of environmental conservation. Even more exciting was the school’s participation in JVH’s recycling initiative: in total, the school collected more than 350 plastic bottles to be recycled, and plans on continuing the eco-friendly effort. JVH is planning on selling the bottles to raise money to re-invest into the organization to pursue other projects, such as their plant and fruit tree-planting efforts at local schools. While still in its beginning stages, JVH has already made tremendous strides. Olivier is working hard, implementing skills he acquired during SUSI, as well as funding from Meridian International Center, to ensure this project is a success. Already, the work of the JVH team is getting noticed. Olivier has appeared on Haitian radio shows on Radio Kiskeya and Radio One, and is working on garnering more traffic and attention to the JVH Facebook page. In commenting on the project, Olivier noted, “One of so many things we [JVH] learned in the past few months is that nothing is impossible when you are working with people who share the same goals and care about the same thing as you”. To learn more about SUSI alumni, check back every week to learn about how former participants are working to save the world! POST TAGS: Haiti, SUSI, U.S. Department of State.